Bethlehem Steel FC lost 3-2 on Sunday to Toronto FC II, as in the game away in Canada in June in a game with interesting similarities and differences and some tough questions worth asking. As in the game away in June, Toronto played bunker and counter. As in June, Shaan Hundal troubled the Steel back line on well-collected, direct service out of the back, although he is now 17 years old, not 16. And he scored twice this time instead of getting a goal and an assist. The winning third goal also came on the counter, as a Steel relaxation when the ball seemed to go into touch did not help. A difference from June is that the Steel fight back at home was even more valiant. And this time they tied the score on a Nick Bibbs goal, his first in USL. On a different day, maybe Corey Burke scores a hat trick of headers and Bolu Akinyode wins Goal of the Week for a last gasp blast from distance into the left upper 90 curling away from the keeper. But those events are an alternate universe. In ours, each was an inch or two wide, or high, or both. A difference is that the two head coaches agreed in their evaluation of the ref, although Bethlehem head coach Brendan Burke’s punishment was to stay and keep watching him. Toronto coach Jason Bent got to leave early. But the defense broke down twice in the second half to go with the one in the first. In fairness on the third goal, Raheem Edwards, Toronto’s left midfielder, made both Anderson and Samir Badr commit to the tackle and miss consecutively. Edwards created the goal even though someone else — Luca Uccello — gave it the final tap. 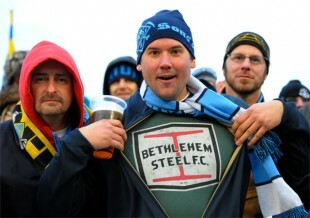 At halftime, the Steel’s first promoted alumnus was introduced to the crowd, together with his new jersey and number. His old coach was proud, and the crowd’s greeting was warm. And the TV commentator’s explanation that Derrick Jones was still being credentialed by MLS on the fourth day after the official signing — the indirect explanation of why he wasn’t playing — contrasts unfavorably to the paperwork-handling efficiency of professional baseball. One goalkeeper??? For the second time this season, the Steel played with no formal substitute goalkeeper available. This second time, the Academy team seasons are finished, so young amateurs are on family vacations instead of playing at US Soccer Development Academy “Nationals.” But Andre Blake was available on the first team, backed up by John McCarthy. Did Matt Jones stay home so that Samir Badr could start with an unknown field player able to cover an emergency? How bare bones will this roster get? When Fred came on for the injured Seku Conneh at the very end of the first half, the Steel’s central midfield became even slower afoot. The Steel had the league minimum 12 professional players on its own roster already, without considering injury. Anthony Fontana of the Academy will be back from family vacation, and someday Mark McKenzie will have healed. But for right now “next position player up” is sadly amusing. The philosophical tenet that “you shouldn’t do it in a game if you haven’t done it in practice” has to stand aside. All hands need to be on deck, and all hands will need to do whatever is necessary. The roster is no longer economically thin. It is life-threateningly anorexic. Will bunker ball and counterattacks be all Bethlehem sees? The Steel defense remains vulnerable to an opponent who bunkers in and plays for the counterattack. Toronto has beaten them twice this way, as has Harrisburg most recently. In anticipating the coming game against Charlotte in a post-game interview, Burke said he was glad that Charlotte likes to come out and play instead. But will they? Why are there a seemingly unusual number of slips on the grass at Goodman Stadium? I haven’t watched any games at Goodman Stadium, but I’m guessing the answer to the bonus question is that it is pretty much the same as at Talen Energy. There are a lot of slips, either because the grass is wet, the players are somewhat clumsy, or it’s just a general franchise tribute to Danny Cruz. I would not have thought of Cruz, very well done. Thanks, Andy. Both teams slip at times that sometimes seem inexplicable. The point has been made to me that Goodman is a football field, not a soccer pitch, and somebody somewhere pointed out that the Steel have gotten Lehigh to improve the grass, but no explanatory detail was provided.